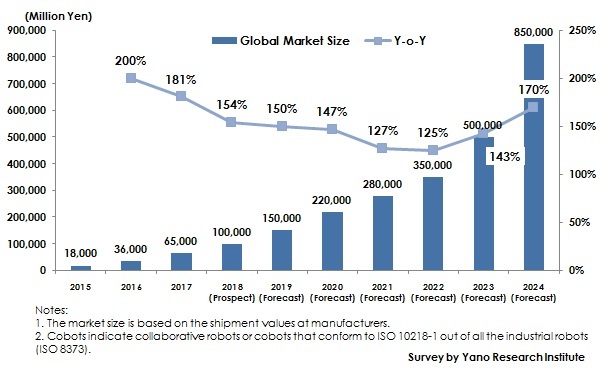 Yano Research Institute (the President, Takashi Mizukoshi) has conducted a survey on the global and domestic cobot markets and has found out the market trends by segment, the trend of the market players, and the future perspectives. Cobots indicate collaborative robots or such industrial robots that conform to ISO 10218-1 and are designed to directly work with humans within the prescribed workspaces. They can be operated in the vicinity of workers without being surrounded by safety fences provided that they are used appropriately, meeting the use requirement. Therefore, cobots have started being used in various circumstances, including those factories lacking spaces for large industrial robots, and at some diners/restaurants, and laboratories of universities and companies. The global cobot market size based on the shipment values at manufacturers has shown rapid growth during the past years, with 18,000 million yen in 2015, 36,000 million yen in 2016, and 65,000 million yen by 2017. It seems to be largely affected by the characteristics of cobots, i.e., space-saving and easy to design and control for coping with any frequent changes in product production. Therefore, cobots have been increasingly adopted at the place unable for large industrial robots to work and for the purpose of complementing labor shortage, primarily in the conventional industrial areas. Currently, the restaurant industry has started using some technologies to solve the problems and to provide new services. One of such a tendency is the cooking services using robots. The systems using cooking cobots have started being operated at some domestic diners, mainly because of labor shortage. For the future, cobots, as the technology available at the workspace very close to the humans, are expected to be used for extensive purposes in the industries that are new to cobots such as the restaurant industry. What is the Cobot Market? Cobots in this research indicate collaborative robots or cobots that conform to ISO 10218-1 out of all the industrial robots defined in ISO 8373. Cobots are the robots designed to directly work with the humans within the prescribed workspaces. Therefore, unlike other industrial robots, they do not have to be surrounded by safety fences and can be operated at a workspace in the vicinity of workers. The global market size of robots in this research is calculated based on the shipment value at manufacturers.